He’s handsome, wealthy, and oh so mysterious…but you can’t judge a book by its cover, right? A fifty-something divorcée turned private eye, Ronnie Lake turns the pages on her current case with her beloved German Shepherd at her side. Adultery, betrayal, and romance are the main characters until murder steals the scene and plunges her into the exclusive–and unlikely–world of rare book collecting. When a first edition valued at half a million dollars goes missing, everyone becomes a suspect…and a target in this stand-alone mystery in the Ronnie Lake series. “A middle-aged private investigator looks for romance—and a murderer—among the moneyed in this mystery novel. In Danforth’s (Delilah, 2016, etc.) new series installment about detective Ronnie Lake, the born-to-money but down-to-earth protagonist…In addition to plenty of intrigue and a whiff of scandal, Danforth offers readers lots of engaging information on collectors’ books, rare coins, and Birkin bags. Readers of a certain generation may also feel nostalgic as songs by such artists as the Beach Boys and Sade serve as the soundtrack while Ronnie traipses from parties to polo matches in her red Mustang ragtop. Overall, the mystery isn’t too difficult to figure out, but the writing is breezy in tone and characters are unconventional—particularly Ronnie, who has a black belt in aikido, looks great in a sleeveless dress, and hasn’t succumbed to many challenges in her life, including a divorce and a son’s recent death in Afghanistan. 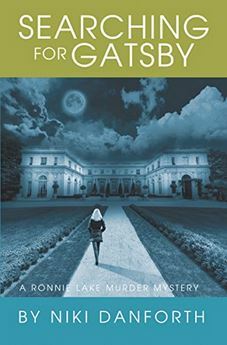 “Searching For Gatsby (A Ronnie Lake Murder Mystery) by Niki Danforth is a marvelous sleuth mystery novel with a unique protagonist. Ronnie may be in her fifties, but she proves that life isn’t over once you hit the infamous ‘over the hill’ mark. Quite the contrary, her character is admirable and inspiring. After experiencing grief and loss, Ronnie’s character, despite her age, picks up the pieces of her life and, using her natural deductive skills, begins fresh. I love this aspect of her murder mystery series. I am looking forward to reading more of her sleuthing exploits. This novel is a fantastic choice for those who are fans of cozy mysteries and is age appropriate for young adults on up.”– Readers’ Favorite rates it 5 Stars!